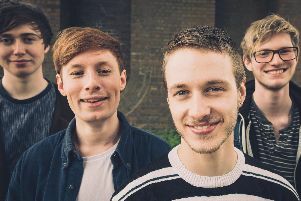 London grunge pop quartet Honey Lung are back in Northampton to play Poetic Horror Promotions' launch night on Friday. The band released their debut EP Kind of Alone at the end of last year and it featured the singles Something and End of Time. The band have already been picked to play this year’s The Great Escape festival in Brighton in May. Supporting will be shoe town dwellers Blood Visions and Future Love. The former’s latest single Sophie Jess is out now and available as a free download from the band’s Bandcamp page. Future Love’s EP Passive Obsessive is also out now. Poetic Horror Promotions is a project of Fox Chapel frontman Kailan Price. It aims to bring noisy parties to Northampton for ‘losers in baggy tees and ripped jeans’. All three bands play at the The Garibaldi Hotel in Northampton. The venue is in Bailiff Street. Music is from 7.30pm. Admission is free.